which was necessary to secure man's salvation. The Son of God, heaven's glorious Commander, was touched with pity for the fallen race. His heart was moved with infinite compassion as the woes of the lost world rose up before Him. But divine love had conceived a plan whereby man might be redeemed. The broken law of God demanded the life of the sinner. In all the universe there was but one who could, in behalf of man, satisfy its claims. Since the divine law is as sacred as God Himself, only one equal with God could make atonement for its transgression. None but Christ could redeem fallen man from the curse of the law and bring him again into harmony with Heaven. Christ would take upon Himself the guilt and shame of sin—sin so offensive to a holy God that it must separate the Father and His Son. Christ would reach to the depths of misery to rescue the ruined race. Before the Father He pleaded in the sinner's behalf, while the host of heaven awaited the result with an intensity of interest that words cannot express. Long continued was that mysterious communing—"the counsel of peace" (Zechariah 6:13) for the fallen sons of men. The plan of salvation had been laid before the creation of the earth; for Christ is "the Lamb slain from the foundation of the world" (Revelation 13:8); yet it was a struggle, even with the King of the universe, to yield up His Son to die for the guilty race. But "God so loved the world, that He gave His only-begotten Son, that whosoever believeth in Him should not perish, but have everlasting life." John 3:16. Oh, the mystery of [p. 64] redemption! the love of God for a world that did not love Him! Who can know the depths of that love which "passeth knowledge"? Through endless ages immortal minds, seeking to comprehend the mystery of that incomprehensible love, will wonder and adore. The plan by which alone man's salvation could be secured, involved all heaven in its infinite sacrifice. The angels could not rejoice as Christ opened before them the plan of redemption, for they saw that man's salvation must cost their loved Commander unutterable woe. In grief and wonder they listened to His words as He told them how He must descend from heaven's purity and peace, its joy and glory and immortal life, and come in contact with the degradation of earth, to endure its sorrow, shame, and death. He was to stand between the sinner and the penalty of sin; yet few would receive Him as the Son of God. He would leave His high position as the Majesty of heaven, appear upon earth and humble Himself as a man, and by His own experience become acquainted with the sorrows and temptations which man would have to endure. All this would be necessary in order that He might be able to succor them that should be tempted. Hebrews 2:18. When His mission as a teacher should be ended, He must be delivered into the hands of wicked men and be subjected to every insult and torture that Satan could inspire them to inflict. He must die the cruelest of deaths, lifted up between the heavens and the earth as a guilty sinner. He must pass long hours of agony so terrible that angels could not look upon it, but would veil their faces from the sight. He must endure anguish of soul, the hiding of His Father's face, while the guilt of transgression —the weight of the sins of the whole world—should be upon Him. The angels prostrated themselves at the feet of their Commander and offered to become a sacrifice for man. But an angel's [p. 65] life could not pay the debt; only He who created man had power to redeem him. Yet the angels were to have a part to act in the plan of redemption. Christ was to be made "a little lower than the angels for the suffering of death." Hebrews 2:9. As He should take human nature upon Him, His strength would not be equal to theirs, and they were to minister to Him, to strengthen and soothe Him under His sufferings. They were also to be ministering spirits, sent forth to minister for them who should be heirs of salvation. Hebrews 1:14. They would guard the subjects of grace from the power of evil angels and from the darkness constantly thrown around them by Satan. Then joy, inexpressible joy, filled heaven. The glory and blessedness of a world redeemed, outmeasured even the anguish and sacrifice of the Prince of life. Through the celestial courts echoed the first strains of that song which was to ring out above the hills of Bethlehem—"Glory to God in the highest, and on earth peace, good will toward men." Luke 2:14. With a deeper gladness now than in the rapture of the new creation, "the morning stars sang together, and all the sons of God shouted for joy." Job 38:7. To man the first intimation of redemption was communicated in the sentence pronounced upon Satan in the garden. The Lord declared, "I will put enmity between thee and the woman, and between thy seed and her seed; it shall bruise thy head, and thou shalt bruise his heel." Genesis 3:15. This sentence, uttered in the [p. 66] hearing of our first parents, was to them a promise. While it foretold war between man and Satan, it declared that the power of the great adversary would finally be broken. Adam and Eve stood as criminals before the righteous Judge, awaiting the sentence which transgression had incurred; but before they heard of the life of toil and sorrow which must be their portion, or of the decree that they must return to dust, they listened to words that could not fail to give them hope. Though they must suffer from the power of their mighty foe, they could look forward to final victory. They were told that since the law of Jehovah is the foundation of His government in heaven as well as upon the earth, even the life of an angel could not be accepted as a sacrifice for its transgression. Not one of its precepts could be abrogated or changed to meet man in his fallen condition; but the Son of God, who had created man, could make an atonement for him. As Adam's [p. 67] transgression had brought wretchedness and death, so the sacrifice of Christ would bring life and immortality. Thus were revealed to Adam important events in the history of mankind, from the time when the divine sentence was pronounced in Eden, to the Flood, and onward to the first advent of the Son of God. He was shown that while the sacrifice of Christ would be of sufficient value to save the whole world, many would choose a life of sin rather than of repentance and obedience. [p. 68] Crime would increase through successive generations, and the curse of sin would rest more and more heavily upon the human race, upon the beasts, and upon the earth. The days of man would be shortened by his own course of sin; he would deteriorate in physical stature and endurance and in moral and intellectual power, until the world would be filled with misery of every type. Through the indulgence of appetite and passion men would become incapable of appreciating the great truths of the plan of redemption. Yet Christ, true to the purpose for which He left heaven, would continue His interest in men, and still invite them to hide their weakness and deficiencies in Him. He would supply the needs of all who would come unto Him in faith. And there would ever be a few who would preserve the knowledge of God and would remain unsullied amid the prevailing iniquity. But the plan of redemption had a yet broader and deeper purpose than the salvation of man. It was not for this alone that Christ came to the earth; it was not merely that the inhabitants of this little world might regard the law of God as it should be regarded; but it was to vindicate the character of God before the universe. 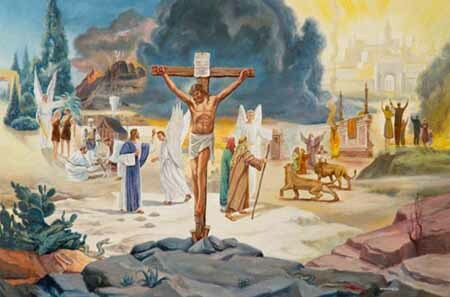 To this result of His great sacrifice—its influence upon the intelligences of other worlds, as well as upon man—the Saviour looked forward when just before His crucifixion He said: "Now is the judgment of this world: now shall the prince of this world be cast out. And I, if I be lifted up from the earth, will draw all unto [p. 69] Me." John 12:31, 32. The act of Christ in dying for the salvation of man would not only make heaven accessible to men, but before all the universe it would justify God and His Son in their dealing with the rebellion of Satan. It would establish the perpetuity of the law of God and would reveal the nature and the results of sin. When Satan was thrust out of heaven, he determined to make the earth his kingdom. When he tempted and overcame Adam and Eve, he thought that he had gained possession of this world; "because," said he, "they have chosen me as their ruler." He claimed that it was impossible that forgiveness should be granted to the sinner, and therefore the fallen race were his rightful subjects, and the world was his. But God gave His own dear Son— one equal with Himself—to bear the penalty of transgression, and thus He provided a way by which they might be restored to His favor, and brought back to their Eden home. Christ undertook to redeem man and to rescue the world from the grasp of Satan. The great controversy begun in heaven was to be decided in the very world, on the very same field, that Satan claimed as his. It was the marvel of all the universe that Christ should humble Himself to save fallen man. That He who had passed from star to star, from world to world, superintending all, by His providence supplying the needs of every order of being in His vast creation—that He should consent to leave His glory and take upon Himself human nature, was a mystery which the sinless intelligences of other worlds desired to understand. When Christ came to our world in the form of humanity, all were intensely interested in following Him as He traversed, step by step, the bloodstained path from the manger to Calvary. Heaven marked the insult and mockery that He received, and knew that it was at Satan's instigation. They marked the work of counteragencies going forward; Satan constantly pressing darkness, sorrow, and suffering upon the race, and Christ counteracting it. They watched the battle between light and darkness as it waxed stronger. And as Christ [p. 70] in His expiring agony upon the cross cried out, "It is finished" (John 19:30), a shout of triumph rang through every world and through heaven itself. The great contest that had been so long in progress in this world was now decided, and Christ was conqueror. His death had answered the question whether the Father and the Son had sufficient love for man to exercise self-denial and a spirit of sacrifice. Satan had revealed his true character as a liar and a murderer. It was seen that the very same spirit with which he had ruled the children of men who were under his power, he would have manifested if permitted to control the intelligences of heaven. With one voice the loyal universe united in extolling the divine administration. Click here to read the next chapter: "Cain and Abel Tested"